HUMBOLDT PARK — Tens of thousands came out to Humboldt Park Saturday for day two of Riot Fest 2013. 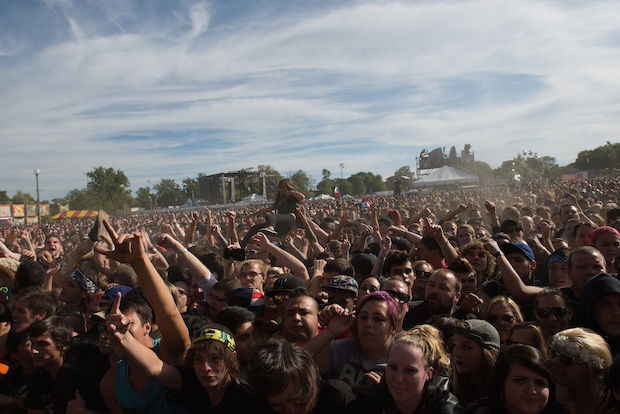 On Friday, an estimated 30,000 people attended the fest to see Joan Jett, Danzig, Fall Out Boy and more bands. Event organizers said Saturday likely exceeded that count. "We've already sold out of a lot of things," said Ruth Cook, a 20-year-old New York resident selling Riot Fest gear on Saturday. "It was crazy yesterday — the line was backed up, and today looks even busier." This is her first time on the Riot Fest circuit, but, as of Saturday morning, the Albany native was seeing all work and no play. "Hopefully tomorrow I'll get to go out and see some bands," she said. Sarah Ryan and her 2-year-old daughter, Adelaide, were enjoying a set nearby. The Ryan family drove about 13 hours from New York for Riot Fest, they said. "[Adelaide] is loving it," Ryan said as her daughter pulled up grass, sporting a pair of noise dampening headphones to protect her ears. "She loved Dessa — she was dancing the entire time." "Saturday Night Live" alum and Chicago comedy staple Tim Meadows was spotted rocking out to Dinosaur Jr. Saturday afternoon, and Public Enemy's Flavor Flav reportedly took a minute to weigh in on Chicago, saying the city should be closing prisons, not schools. Throughout the day the crowds swelled, and the biggest draw of the night seemed to be Blink 182. Fans climbed fences to get a view of the stage, and at one point fans toward the front of the stage were crushed in the mosh pit. In the middle of their set, the band told the crowd to step back two feet to add space in front of the stage where people fell to the ground. "If someone falls, help them up," said Mark Hoppus, one of the band's lead vocalists. "I shouldn't have to tell you that." Six people were hospitalized with minor injuries. The pop punk acts seemed to draw the most rowdy fans this weekend, as Fall Out Boy had to give similar warnings Friday night. Fall Out Boy's Patrick Stump told fans to "back the f--k up" and allow security to remove some fallen people, and someone in a wheelchair, from the pit. Despite the big crowds and loud music, no serious injuries or crimes had been reported through Sunday morning, authorities said. Discarded trash pilled up near the most popular stages, but fans didn't seem to mind as their favorite bands launched into their sets. Meanwhile, Jim Victor's Butter Stamos sculpture remained a hit with the crowd as he added even more detail to the John Stamos life-sized statue. "You could add [details] forever," he said from inside the air conditioned mobile studio. "At some point you've just got to call it." Riot Fest continues Sunday when headlining acts the Pixies and The Replacements take to the stage — and if you're heading over, you might want to bring a poncho. Rain is expected throughout the day. No large umbrellas are allowed into the festival, but small umbrellas are ok.